In much of the financial services industry, with the proliferation of vice presidents, variations on this job title have been created to denote higher-ranking Vice Presidents. Job titles and the conventions that surround them can vary widely between firms, especially in the security and banking industries. In fact, some firms may not offer a First Vice President title at all. But traditionally, First Vice President — also called a First VP or FVP — is one of these, typically seen in brokerage, securities, and investment banking firms. A First Vice President usually supervises a small but especially important group of other employees. The First VP may be a recognition title that comes as a result of a promotion in place rather than pursuant to a promotion into a higher rung on the firm’s management ladder. Other firms may place the position higher or lower in their management hierarchies than their peers in the industry, relative to other variations on the VP title. Recognition titles are not necessarily linked to your place in your firm’s hierarchy, peers in the organizational chart may have titles of varying prestige. For example, a divisional controller in a matrix reporting relationship with the corporate CFO (solid line) and divisional head (dotted line) probably will have his or her recognition title determined by the corporate CFO. Meanwhile, his or her peers within the division, consisting of various business unit heads, will have titles set by the divisional head. Thus, you may have a case where, for instance, the divisional CFO bears a First VP title, while those peers who are business unit chiefs will have loftier Senior VP titles. While policies may differ among firms, normally once someone has been granted a particular recognition title, he or she will retain it even after suffering a demotion. 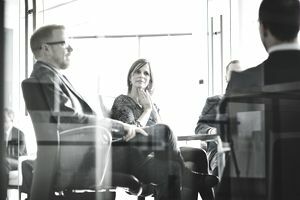 In an actual case, a divisional CFO had serious running disagreements with the corporate CFO, which caused him to fall from favor and be replaced. Held in high regard by the divisional head with whom he had a dotted line reporting relationship as divisional CFO, he had to accept a job one rung below. He became a product manager reporting to one of the business unit heads who formerly was one of his peers, while he was divisional CFO. He retained his First VP title, however, which actually was more appropriate to his new position than to his former post. In a footnote to this case, the corporate CFO was obsessed with management reporting formats and colorful graphics. The divisional CFO was not, being more concerned with the accuracy and relevancy of the data presented therein. When the corporate CFO insisted on including misleading and ill-thought statistics in his reports, and was not sharp enough to grasp the clear, cogent arguments against them that his subordinate offered, this became a cause of great frustration for the latter and led to a very strained relationship that ended in his ouster.